The Zeiss Conquest V4 riflescopes are for hunters and shooters whose lifestyle and adventures involve traditional and long-range hunting, as well as shooting and long-range shooting. These riflescopes were designed as a lightweight, high-performance product line for various demanding hunting and shooting applications. They are by any standard best-in-class. The Conquest V4 family is based on a 4x zoom ratio, incorporates a 30 mm main tube, and consists of the 1-4×24, 3-12×56, 4-16×44 and 6-24×50 models. Each model delivers 90% to-the-eye light transmission, offers .25 MOA click values, capped windage adjustment, second focal plane reticle designs, and a large range of total elevation and windage travel adjustment. The 1-4×24 model is available with either capped or external elevation turrets, while the 3-12×56 version comes standard with capped elevation and windage turrets. The 4-16×44 and 6-24×50 models have external elevation turrets. Within the Conquest V4 product line, all external elevation turrets also include ZEISS’ Ballistic Stop feature to ensure an absolute and positive return to zero under any conditions. There are several reticle options available. These include traditional plex-style reticles, as well as ZEISS’ newest ZMOA and ZBR MOA-based smart reticles. 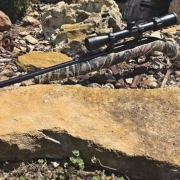 The ZQAR reticle, available with the 1-4×24 model, represents an intelligent reticle design, based upon certain .223 Remington and .308 Winchester ammunition ballistics. 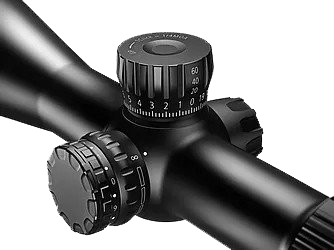 Illuminated reticles are standard for the 1-4×24 model and optional for the 3-12×56 and 6-24×50 models. A magnification power throw lever is available as an optional accessory. The Conquest V4 models are backed by ZEISS’ Limited Lifetime Transferable Warranty and Five-Year No-Fault Policy. These riflescopes serve a wide range of hunting and shooting applications, are packed with unique features, perform beyond expectations in their price range and provide exceptional value.